Milk packaging black and white film is an excellent dairy product packaging material, with unique function of avoiding light and obstructing oxygen, at the same time, it is low price, convenient transportation, small storage space and strong practicality. It guarantees the shelf life of milk, but also greatly reduces the cost of product packaging, very in line with the current environmental protection requirements, is common form of packaging at present. 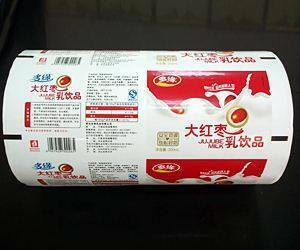 Simple milk packaging film, generally is single-layer film, which is made by polyethylene material and a certain percentage of white masterbatch. Milk packaging black and white plastic film is mainly used in three or more layers of co-extruded, use LDPE, LLDPE, EVOH, mLLDPE resin, match up black, white masterbatch, co-extruded blown into high performance composite film. Milk packaging black and white plastic film packaging performance is good, the price is relatively low, reducing the cost of the company, expanding the sales radius of milk, is the cost-effective ultra-high milk packaging form.